Episode Forty Four: The Star Wars Trailer Episode. A unique episode. A One Shot, if you will. The final, full trailer for “The Force Awakens” debuted this past Monday during halftime of Monday Night Football. It seems like the world has been different ever since. Our fervor for Episode VII has reached critical mass. We examine the excitement and reaction to the trailer, the surge of online ticket sales, and we unpack with sincerest love the new trailer shot by shot. We gush and we speculate and we fall in love with Star Wars all over again. Watch it for yourselves and feel The Force flow through you. 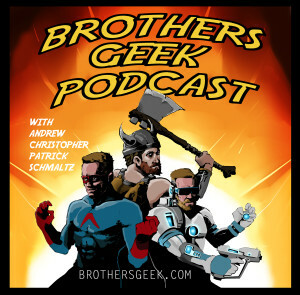 This entry was posted in Podcasts on October 25, 2015 by BrothersGeekadmin. Forty Three: This Movie needs Giant Robots Punching The Ghosts. Episode Forty Three: This Movie needs Giant Robots Punching The Ghosts. We have a looooonnnnngggg, in depth, and, erudite discussion on the current state of Fall television. What we like, what we wish was better, what we are slowly losing interest in and what we have already lost interest in entirely. All have seen “Bridge of Spies” We each feel differently. Patrick has major issues with “Crimson Peak” It’s weak. On many levels. Andrew has consumed “Abbadon’s Gate” The Expanse is a fantastic series. He loves so many characters and wishes his favorites would return more often. Christopher teases he won’t have to wait very long. Patrick is reading “Aeronaut’s Windlass” by pod-cast favorite Jim Butcher. It’s mostly just fun, he wishes it was great. Christopher is reading like 29 comics books right now and “Aeronaut’s Windlass” He feels similar to Patrick. Patrick plays “Betrayal on House on the Hill” with his Partners in Crime Shane and Gabby. He was the Betrayer! Thing became very intense. Andrew and Chris continue to love all the content in “Destiny: The Taken King“. Andrew says it’s almost too much and he needs to focus more and get things done. In Episode III, Obi-Wan Kenobi is sent on a mission to hunt down General Grievous on Utapua. After an intense lightsaber dual and perilous chase, Obi-Wan manages to shoot Grievous just before the Droid General can escape. What two word comment does Obi-Wan make after using a blaster to finally defeat Grievous? This entry was posted in Podcasts and tagged Arrow, Betrayal on House on the Hill, Bridge of Spies, Crimson Peak, Destiny, THe Aeronaut's Windlass, The Flash, The Taken King on October 21, 2015 by BrothersGeekadmin. Discussion: Favorite Mars related movie. Andrew and Christopher watch “Blindspot” The main conceit of the series is dumb but the two main actors are very engaging. Andrew reports on “Agents of S.H.I.E.L.D” hopes they incorporate more of the Marvel comics Inhumans. Black Bolt is a great character. Christopher watches “The Blacklist” and “Fear the Walking Dead“. He refused to disclose spoilers on the one thing Andrew cares about on that show. “Fear The Walking Dead” is awesome and fills in the time gap nicely “The Walking Dead” created with Rick’s coma. Patrick is through season 8 of “Doctor Who”. He still has issues with Capaldi’s Doctor and Jenna Coleman’s Companion. All are excited for Season two of The Leftovers. IT BEGINS OCT 4Th! “The Aeronauts Windlass“. Jim Butcher’s new steampunk series. It has talking cats. Chris is enthralled. Patrick is scratching the surface and it’s awesome fun. Christopher has dived in “Marvel’s Secret Wars” by Jonathon Hickman. It has created an interesting new world to explore. Andrew is still deep in “The Expanse” books. “Abbadon’s Gate” started slow but has since punched the accelerator in the face and show no signs of letting up. Chris and Andrew give “Destiny The Taken King” rave reviews. More content, more fun than Vanilla “Destiny”. Chris also has gotten into “Forza 6” The game creates a intense and realistic racing simulation. Patrick mobile gaming continues with “Dungeon Quest“. He is Level 40 and 50th stage of 200 stages. He may break his own rule and spend some money on mobile gaming unlock new content. In “Episode Two: Attack of the Clones“. The Battle of Geonosis is the climax of the film. Who is the Leader of the Geonosian people who ordered the execution of The Jedi and Senator Amidala? It’s funny and the Boys have no idea. This entry was posted in Podcasts and tagged Destiny, The Martian, The Taken King on October 5, 2015 by BrothersGeekadmin.